Entertaining for ALL age groups! What made the experience of listening to Faery Swap the most enjoyable? Mark Mullaney did a wonderful job narrating this story; he managed to give each character a unique voice and he made it feel like I was listening to it happening in real life. I never felt like a character's voice was copied from another one. If I had to choose, I liked Finn the best; he had a great sense of humor and I felt like this character was extremely realistic. I would hate to give anything away, but there were some pretty emotional moments between Finn (the main character) and his father. For a book written for teens, this book had a surprising amount of emotional depth. 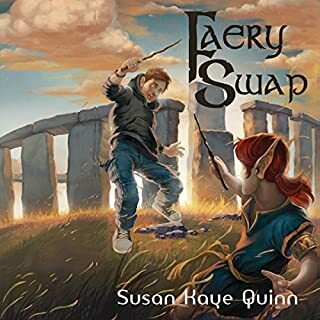 Faery Swap, even though it was written for the young-adult audience, was very enjoyable for me (late twenties). The father/son dynamic was very relatable and there was plenty of action to keep the story exciting. I would definitely recommend this to anyone who likes books in the fantasy/adventure genre. The city of Astreiant has gone crazy with enthusiasm for a new play, The Drowned Island, a lurid farrago of melodrama and innuendo. Pointsman Nicolas Rathe is not amused, however, at a real dead body on stage and must investigate. A string of murders follow, perhaps related to the politically important masque that is to play on that same stage. Exciting from start to finish! 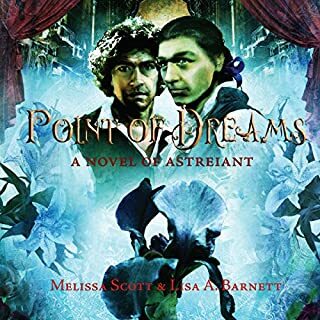 Would you listen to Point of Dreams: A Novel of Astreiant again? Why? From what I understand this is only one of many books written by the authors that follow the same two protagonists and exist in the same universe. This book stands alone just fine­ I had not read the first and was able to follow the plot and characters just fine. After reading this book I am very interested in seeing what other mystery’s/debacles these two found themselves in (and these prior cases are occasionally referenced). What was one of the most memorable moments of Point of Dreams: A Novel of Astreiant? I don't want to spoil the story for anyone, but there was a confrontation between the main characters and the villain towards the end that was particularly exciting to listen to and experience. It's a mystery, after all...I don't want to give it away!! It made the story more exciting to hear it told in the different voices of many characters; I counted more than 40 characters in this book and it felt like each of them had a unique voice and personality. I loved the dry humor in the story and I found myself chuckling while listening to certain parts. The subtlety of this book, though, is really one of its strong points. The book is basically one part classic full­-of­-detail murder­ mystery, one part character driven, and one small part steampunk­/sci-­fi. Thomas Hammer, a pit bull shifter, is bound by magic in his canine form and needs to find a way to break free. He wants to show his owner, Desiree Duvall, the man of her dreams sleeps at her feet every night - she just doesn't know it. Hammer battles members of his old pack out for revenge and tries to protect Desiree from harm. He also discovers a secret organization of shifters who protect the outside world from discovering their existence. Even if Hammer breaks the spell, he still has to win the girl and save the day. Or he can sit, roll over, and play dead.